Home Costs > How Much Does a Home Bar Cost? A home bar is a great idea for those who want to bring the bar atmosphere straight to their home to share with family and friends. This is a great way to stock drinks in your home without having to pay for the overpriced bar tabs. A home bar is generally installed either in a basement or even outdoors. The price of installing a bar will vary depending on the size you want, the features you are interested in and the setup. On average, a home bar is going to cost anywhere from $500 for those who want to do it themselves with a simple design to more than $10,000 to $15,000+ for a professional looking bar done by a professional. As with any home improvement project, it will depend on the scope of your project, the materials, finishes, geographical location and contractor you choose. To give you a good idea, professional contractors say to budget about $350 per linear foot for a basic install. A simple 45-degree bar, for example, which tends to be the most popular, would cost around $2,000 to $4,000 if installed by a professional contractor. A straight bar will be significantly less since the design is a lot simpler. Bars on the higher end tend to be made from a premium wood and will have granite counters. For an outdoor bar, many tend to choose a tiki bar. A tiki bar can cost anywhere from $200 to $3,000. A higher-end, customizable tiki bar will usually cost a little more than a standard pre-built bar. Pre-made bars that seat two to four people or more can cost anywhere from $200 to $600 depending on the style and size. These bars may already be built, while some may need to be put together just like furniture. Angie’s List notes that the average cost of a small bar can be $2,000 to $4,000, while a larger bar with a lot of features can cost $6,000 to $12,000. For example, they note a bar with tile flooring and marble countertops can cost $6,000 to $12,000. According to craftsmanbasementfinish.com, a custom wet bar with a granite countertop, glass tile backsplash, glass shelving, puck lighting and a stainless steel undermount sink could cost $19,560. There are three common options when it comes down to building a home bar. This can include hiring a contractor to build a customized option or buying a manufactured bar that’s already prebuilt. The last option can be a DIY home bar, where you would take on the entire project yourself and follow some sort of blueprint. The contractor option will always be the most expensive option and will be able to do everything from building the bar to installing electrical outlets. A manufactured bar will be prebuilt or it may have to put together like furniture. These bars tend to be very simple and won’t have a lot of options like a custom build. Lastly, a DIY option can often follow a blueprint found online and you will have to do all the work on your own. With most bars, regardless of the way you build it, will often use a wood or natural stone countertop. Wood is a good option because it tends to be the most affordable option and depending on the type, it can display a nice appearance. Natural stone counters will be the other countertop option and can include either marble or granite. This type will be the most expensive option, but it’s able to withstand a lot of wear and tear and is also capable of resisting liquid stains. Although there is a range of styles and shapes, most home bars will either be a straight line or shaped as an L. As for the bar dimensions, the standard height will be 42 inches from the floor and this allows a standard 30-inch bar stool to set patrons comfortably at the bar. As for ttophop surface, it will be 16 to 20 inches wide on average. Common equipment used in a bar can include the following: dump sinks, 3-bin sinks, glass washers, drainboards, soda guns, ice bins, speed rails, blender stations, draft beer stations, bar coolers, hand sinks and ice machines. Depending on the bar setup, some people often replace the floor around the bar to give it its own feel. Tile flooring is often the most popular option since it’s able to clean up spills easy and can make the bar’s atmosphere look nice. If you want to add a keg or a specialized refrigerator in order to keep the drinks chilled, this will be an extra cost to consider. Installing a bar-sized refrigerator can cost around $500. Bar stools can cost anywhere from $50 to $300 per stool, and this will depend on the size and material. Other miscellaneous accessories such as pictures and light fixtures are items to consider. Some opt to tear up the flooring around the bar area and install either tile or wood flooring. Depending on the type of flooring you choose, this can cost anywhere from $1 to $5 per square foot. Don’t forget you have to stock the bar. Primer.com breaks down the liquor you will that doesn’t break the bank. A wet bar will have a sink with running water and a drain, while a dry bar won’t have any plumbing, but instead, it’s designed to simply hold bottles and accessories. A dry bar can often be portable since no plumbing and/or electrical will be connected to it. 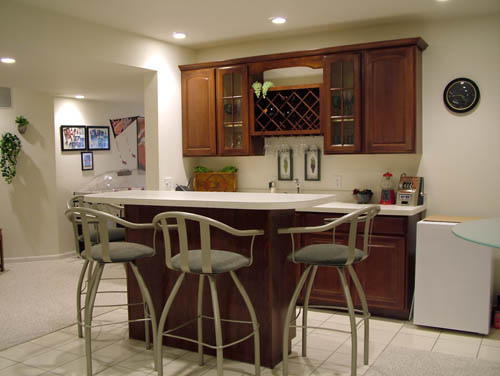 A wet bar, on the other hand, will have to be connected to a plumbing and/or electrical source and will be permanent. Highly consider building a bar yourself. There are many bar plan resource sites online that can help you pick out a bar plan that suits your needs. Even if you are unsure how to do the plumbing and electrical work, you can always outsource these smaller jobs and do the rest yourself. When hiring a contractor, be sure to ask around and talk with at least three contractors. Services such as HomeAdvisor.com can help you find the cheapest quote in your area. Remember that the cheapest quote is not always going to mean the best work. It is also advisable to look for previous work that has been done by the company you choose. If you want a manufactured home bar, consider purchasing one used on Craigslist.